The quilting group that I belong to, are putting together a quilt for a raffle. It is going to be very colourful when it is finished. We are using the English paper piecing method (all handstitched) to make the blocks. Everyone was given two blocks to complete (I think there are 80 blocks in total to do) . I have finished my first block. 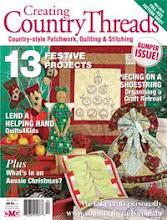 I am going to bring the second block pieces with me on the train to sew tommorrow, when I go to the Brisbane Craft & Quilt Fair. what beautiful fabric, and the block is so perfect. 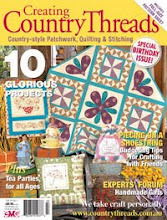 I have been thinking of trying the hand stitching since seeing it in a magazine. Oooh I like the block. The fabrics are beautiful. I hope we get to see the completed quilt? Or at least your second block. Hope you had an enjoyable time at the Craft and Quilt show.